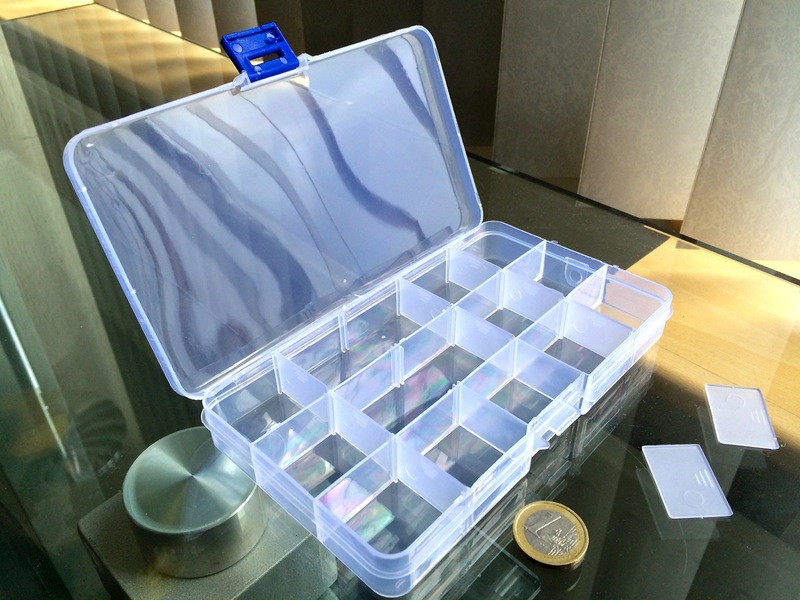 As one of my first orders from Banggood, I bought this convenient little 5×3 storage box. These containers are available in different size configurations, each with different sized compartments that can be combined with removable dividers. I still keep my ICs and other parts sensitive to static shocks in antistatic bags and tubes, but the boxes are great for LEDs, tactile switches, trimpots, crystals, various USB and power jacks, etc. I was tempted to get the largest box with 6×6 compartments, but at the time I wasn’t sure my new hobby would hold my interest long enough to need that much space. Boy was I wrong… My storage box is now completely filled, with the rest of my collection in that dreaded pile of plastic bags, waiting for a more permanent home. I’m now considering either buying one of the larger sizes, or getting one of those wall mounted storage bin racks. The second item in my order was another breadboard. 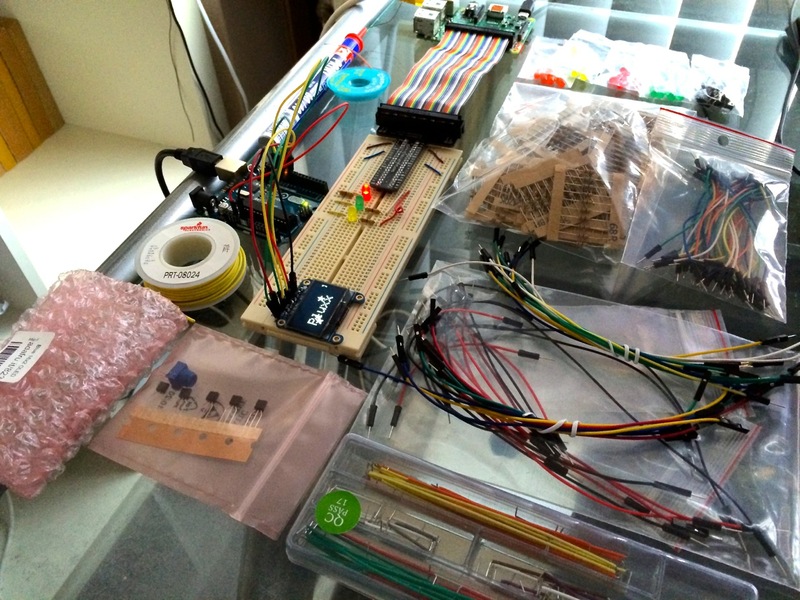 My first breadboard is pretty much permanently attached to my Raspberry Pi through a GPIO breakout adapter, and the space left isn’t enough to house both my Pi and Arduino projects. If you don’t have at least one of these lying around, stop everything and order one now. Solderless breadboards are the easiest and fastest way to experiment with various through-hole parts, and allow you to quickly build and test a prototype before moving it to a more permanent stripboard or protoboard. 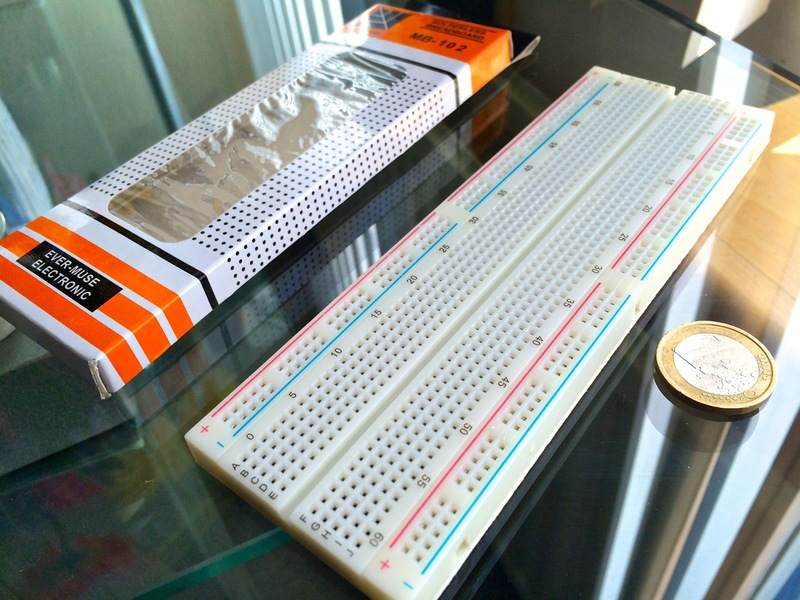 Breadboards come in various sizes. I prefer full-sized 830 tie point breadboards, with red + / blue – marked power rails on both sides divided in the middle. This allows you to either connect the rail sections together with jumper wires, or use up to 4 different power sources. Breadboards with the same number of tie points can have slightly different physical dimensions, depending on the product range and manufacturer, so make sure to carefully measure your board before buying that nifty breadboard power supply. The final item I ordered consisted of some RGB LEDs. After playing around with regular single color LEDs for a while, I wanted something more advanced to light up. I chose ‘frosted’ LEDs, because they diffuse the light, resulting in a more even glow compared to clear LEDs. Common cathode RGB LEDs combine 3 LEDs (red, green, blue) in the same plastic shell with a shared cathode pin, so you end up with an LED with 4 pins total instead of 6. You can treat them as any other LEDs. 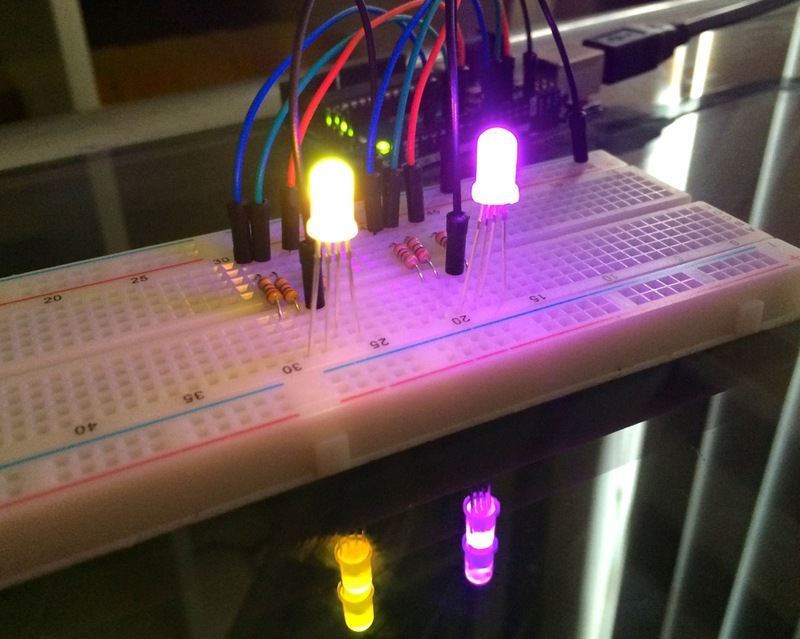 Use the appropriate current limiting resistors for the anode pins, connect the cathode pin to ground, and switch each color channel on/off for some neat color combinations. If you have enough analog output pins available, you can use PWM (Pulse Width Modulation) to control the brightness of the red, green and blue LEDs through software, and generate whichever RGB color you need.